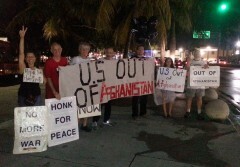 South Florida protest: ‘12 years too long, U.S. out of Afghanistan’ | Fight Back! Hollywood, FL – A group of anti-war activists gathered downtown here, to mark 12 years of U.S. war and occupation in Afghanistan. At the busy intersection of Young Circle Park, protesters held signs to remind the public that the U.S. is still waging war on the people of Afghanistan. People’s Opposition to War, Imperialism, and Racism (POWIR), a local anti-war group, organized the event. The activists braved the rain and winds to demand an end to U.S. occupation, the immediate return of all U.S. troops and an end to wasteful spending on U.S. wars. The organizers stressed that billions of taxpayer dollars are being spent on U.S. wars and occupations abroad, instead of on jobs, healthcare, and education at home. Signs read, “12 years too long, U.S. out of Afghanistan,” “War is not the answer,” “Fund our schools, not your wars” and “Honk for peace.” As cars and buses drove by, they honked in solidarity and the passersby walking in the park made peace signs in support and engaged in discussion. The protesters sang, “All we are saying is give peace a chance,” as they waved the banner and signs. Sandy Davies from Progressive Democrats of America said, “It’s much easier to start a war than to end one. There are still more than 50,000 U.S. soldiers in Afghanistan, and the U.S. has increased the number of air strikes and continues to attack the Afghan people." Davies continued by stating how in 2013 alone, there have been over 2000 airstrikes in Afghanistan, which averages to about five to ten airstrikes per day. The Obama White House more than doubled the number of drones in the air and intensified attacks in Afghanistan and neighboring Pakistan, killing hundreds of civilians, with drone attacks on weddings, funerals and family homes. The southern Florida protest was part of an international day of action opposing the war in Afghanistan.